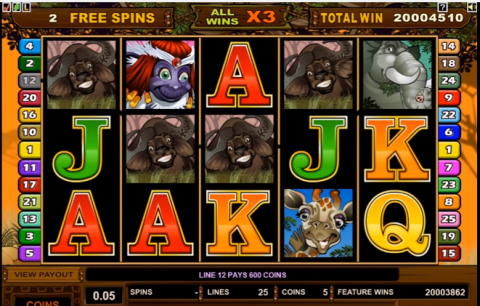 Reasons to Play: Lets face it, you are not going to play MicroGaming’s Mega Moolah because you happen to like cartoon wild animals on a slightly dated 5-reel slot. This game has always been about the progressive jackpot. This is linked between MicroGaming casinos, which means it grows very quickly – multi-million dollar wins are frequent, with the highest prize to date being £13,212,882 and the prize resetting to 1,000,000 Euros each time it is won. This jackpot is triggered randomly, you’ll go to a screen with a spinning wheel and hope to stop on the white paw-print for the Mega jackpot. There are 3 other prize levels (all of which would be welcome) in addition to this multi-million payout. The base game is solid, if unspectacular by today’s standards. The highlight of this is the free spins bonus game, where you will get 15 free spins, each having a 3x multiplier. This is a 5-reel slot, with each reel containing 3 symbols and a total of 25 win-lines crossing them from the left hand side. The king of the jungle (lion) has the biggest single prize. 5 of these will get you 15000 coins (remember, during the free spins game all wins are tripled). Even 4 lions on a line is worth more than the next biggest win (5 elephants). This will bring you 1500 coins. As well as being the highest paying symbol, lions are wilds. This means that they can substitute for any other symbol to complete a winning combination. The exception to this is the scatter / bonus symbol (the monkey) which can’t be replaced. Prizes for other animals are as follows: elephants, 750 coins for 5, buffalo = 600 coins, giraffe = 500 coins, zebra = 400 coins and (every predator’s favorite) the antelope at 250 for 5. All of these animals pay from 3 of a kind and up, with the prizes detailed on the pay table. Brightly colored playing cards, ace down to ten, are also uses – each has a small payout from 3+ on the reels. A monkey with a very cheeky face and bright red hair triggers the free spins round. This symbol is not tied to any of the win-lines – you simply need 3+ anywhere in view to trigger the bonus game. There is an additional win for 2+ anywhere on the reels, which is awarded as a multiplier of your total spin amount. If you hit 5 of the monkeys, you can win 100x your total bet – going down to 2x for just 2. When you hit the free spins you’ll enjoy a jungle tune, black-backed reels instead of light ones and (most important) a 3x multiplier on all if your wins. These spins are at the same betting level as for the spin that triggered them. You’ll see 4 jackpots going up above the reels. From the left to the right these are ‘Mega’, ‘Major’, ‘Minor’ and ‘Mini’. Players are given a shot at winning these at random. You’ll be playing the game and some brightly colored words will appear – announcing the jackpot feature. Next you’ll see a separate screen with a wheel on it, which has colored segments and paw-prints. The jackpots are to the left of this. There is some drumming and chanting to help get you into the mood. You click to spin the wheel, and are hoping that it stops on the white segment (for the multi-million Mega jackpot). You are going to win one of the jackpots – so this is really just a matter of clicking the button and hoping for the best possible result. Mega Moolah is an institution; a game which all online slot fans should take for a spin at least once. Sure, the game is not the most modern, though it is solid and enjoyable – and that shot at a potentially life-changing jackpot can drop in at random at any point while you play. You can enjoy Mega Moolah (and variations), plus the best jackpot slots from IGT, NetEnt and PlayTech at the huge Unibet Casino. You’ll even get 50 free spins on a rival progressive jackpot slot game to get you off to a flying start. Check out www.unibet.com for the details now!